Look What I Found in the Quarter Bin! Well, it wasn't exactly in the quarter bin. But there was a half-price sale at Atlas Comics last week and I paid $1.50 instead of the $3.00 that was marked on the tag. The Omega Men #29. The cover date is August 1985. That particular issue slips your mind, you say? For a quick reminder, you can see the cover here. The reason I bring it up is because that issue has a drawing by ME published in it! Yes! Back in those days of voluminous free time I would write letters to the editors of some comics, and a few of them did find their way into print. I even suggested a title for a letter column that was selected and used for a number of years (namely, "Via Pony Express" over in Weird Western Tales and/or Jonah Hex). 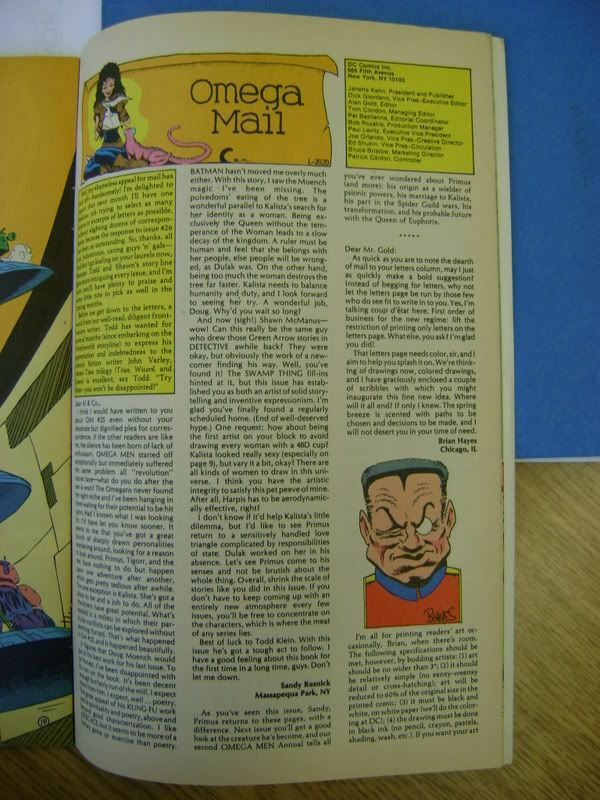 I don't hesitate to reveal to you that I would write letters to comics that were known to receive the fewest letters. I can guarantee you'll never find a back issue of Batman or The Legion of Super-Heroes with a letter from me because I never wrote to those best-sellers. 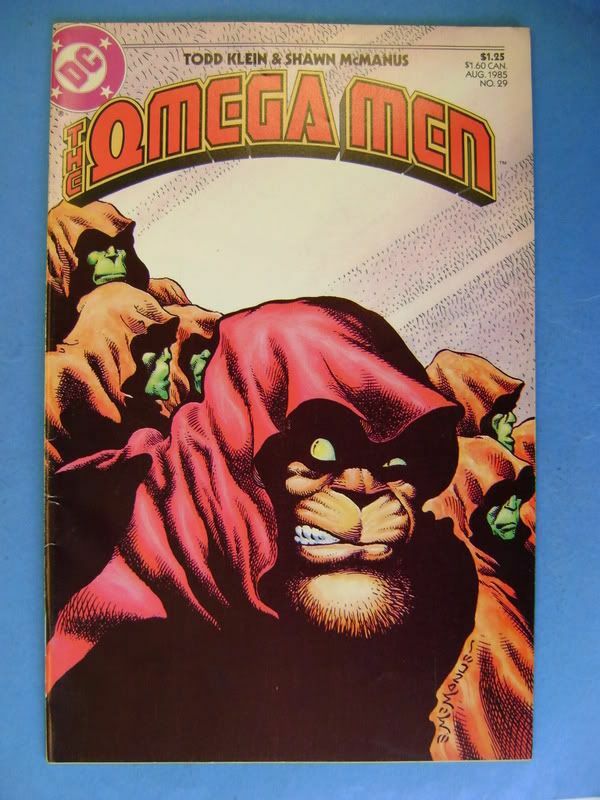 Instead I was writing to Weird Western Tales and Weird War Tales and, yes, The Omega Men. Machiavellian of me? No. I just figured that if I was taking the time to write letters in the hope that they would get printed, I might as well write to titles most in need of letters to print. The strategy is analogous to buying shares of stock in a company when they are at a sixty-five year low. As quick as you are to note the dearth of mail to your letters column, may I just as quickly make a bold suggestion? Instead of begging for letters, why not let the letters page be run by those few who do see fit to write in to you? Yes, I'm talking coup d'etat here. First order of business for the new regime: lift the restriction of printing only letters on the letters page. What else, you ask? I'm glad you did! That letters page needs color, sir, and I aim to help you splash it on. We're thinking of drawings now, colored drawings, and I have graciously enclosed a couple of scribbles with which you might inaugurate this fine new idea. Where will it all end? If only I knew. The spring breeze is scented with paths to be chosen and decisions to be made, and I will not desert you in your time of need." And here is a photo of that printed letters page. 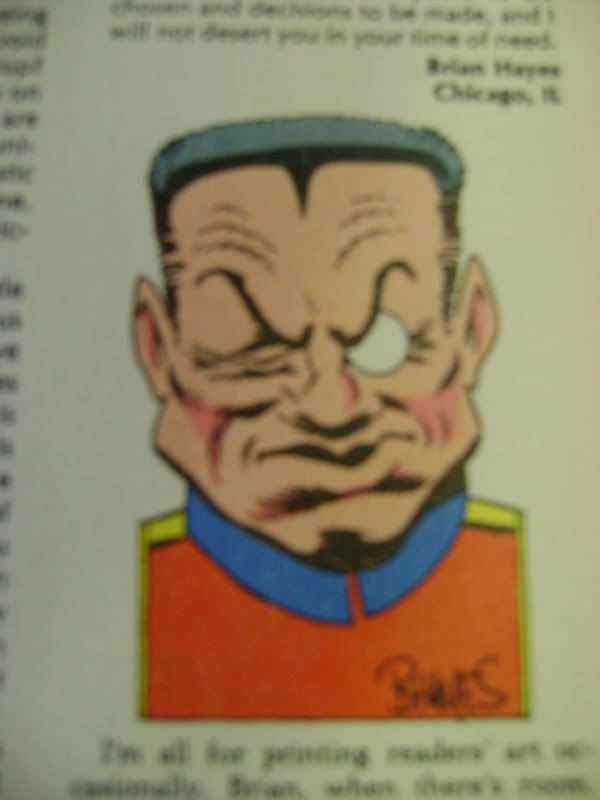 Yes, that is Virmin Vundabar, one of the great characters from Jack Kirby's Fourth World. Maybe V.V. was appearing in a storyline in OM at the time? I don't remember, but it must have been pertinent in some way since Mr. Gold did print the drawing. You wish you could see a larger image of the drawing itself? Okay! Just look here (and sorry about that slight blur). And click here to see V.V. as drawn by J.K. himself. "I'm all for printing readers' art occasionally, Brian, when there's room. The following specifications should be met, however, by budding artists: (1) art should be no wider than 3"; (2) it should be relatively simple (no eensy-weensy detail or cross-hatching); art will be reduced to 60% of the original size in the printed comic; (3) it must be black and white , on white paper ( we'll do the coloring at DC); the drawing must be done in black ink (no pencil, crayon, pastels, shading, wash,etc.). If you want your art back, be sure to enclose a SASE. Bear in mind, too, that a letter mailed for OM #26 won't see print till OM #30, and that's a long wait you have to settle down for. Mr. Gold's invitation to others to send in artwork for publication fell flat and there were no other takers. I realize that this entire topic is somewhat anachronistic in that letters pages have been almost entirely absent from comics for the last ten years or so, but they used to be vital. And, by the way, I did get a handful of other drawings published on other DC Comics letters pages around this same time. I'll have to tell you more about them later since I'm fresh out of time for today!